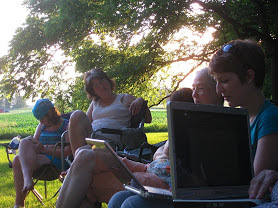 In July 2008, I acted on a long-standing desire to host a retreat at a family farmhouse in Larwill, Indiana, and SwampFire Retreat for Artists and Writers was born. Ten years later and SwampFire has become an annual and much anticipated event, now hosted by potter Steve Smith of 4 Corners Gallery Studio and Pottery and co-organized with poet and Defiance College English professor Mary Catherine Harper. I am grateful for SwampFire–the people, the event, and the site which is so marvelously maintained by Mary Catherine–as a central component of my creative community and life.